The regional Transit Hub will be built at the south-west corner of our neighbourhood. There is a good article in The Record about it which everyone should read. This structure, and all the buses and trains that will pass through it, will have a huge impact on the MHBP area. The Record article talks about many “multi-use pathways” leading into it and a “public plaza” at King and Victoria streets. This is all very exciting (particularly if they manage to keep The Beer Store as a tenant!) but there are a few things we need to keep in mind. First: this development is huge (massive, game-changing, neighbourhood-defining) and it is not that far off. The article says it will open in 2017. That is only four years away, and so far we have seen no official renderings of any models, plans, drawings etc. The Record shows “one of the artist concepts” but it is pretty vague. We have had a lot of plans and studies, but very little solid information about how it is going to work. Even though it is a huge area, when I think of how large the existing Via/Go station is AND the existing Charles Street terminal with all the bus loading areas, the 1.6 Hectare site doesn’t seem so big any more. In fact, I think it will be impossible to cram all those bus and rail and LRT services into that one spot and they will wind up keeping the Charles Street terminal at least partially open. But we in the MHBPNA are really looking forward to seeing what is being planned. When will the Regional show us some proposals so we can get a better idea of the scale of the project? 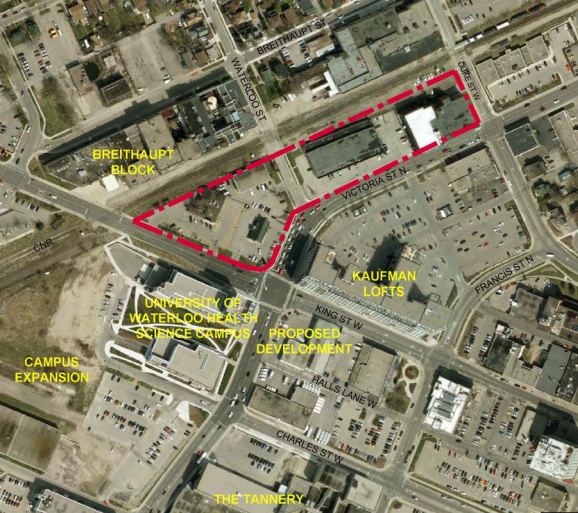 Second: we are losing Waterloo street as an exit from our neighbourhood to the down town. The street will run into the back of the Transit Hub. The MHBPNA hopes there will be an easily accessible route (tunnel?) so that cyclists and pedestrians can continue to cycle/walk through this area on their way to the Market, Blues Festival, concerts, skating rink or whatever activities in which they participate. At one of the meetings we attended there was a proposal to have steps as part of this route and we disagree with that concept. We understand that cars will no longer fit into this, but we want this route to be as accessible as possible. Let’s all stay involved with this process. It is a big deal and will define the area for many generations so “stay alert and watch for the signs”. Well said, Ted. Big changes equal big opportunity, but I agree that the layout and design must be done properly to be successful… Lets keep involved as the design comes closer to reality.